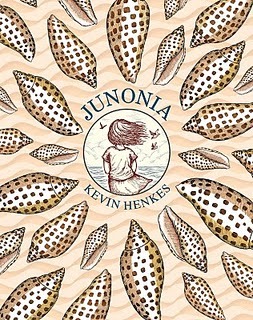 Junonia by Kevin Henkes. Greenwillow Books, 2011. Currently available. Face Value: I love this cover. It’s recognizably a Kevin Henkes book (because who else would draw a seashell and a little girl like that?) but it’s also decidedly more grown up than his picture books. Holding this book makes me feel like I am at the beach. Does it break the slate? Not, not really. And that’s too bad because this is a nice book. Alice is a smart little girl, but she’s not bold. She’s very passive. And this book gives just a snippet of Alice’s a life – a few days at the beach. We do not get to see Alice with her peers, so we have no idea how she would interact in that setting. I want to point out that just because this book isn’t slatebreaking doesn’t mean that I don’t recommend it. It’s incredibly interesting, and really quite an impressive work from Henkes. It just doesn’t show a female character actively changing the circumstances around her. Who would we give it to? I would give this book to introspective, young types. Anyone who summers (or winters) in a seaside setting might like this book for its rich description of the environment. I think it would make a great vacation book for a young reader. Review: For some kids, birthdays are a big deal. I would get so excited about birthdays and have these carefully constructed plans for how the day should be celebrated. If it didn’t live up to my expectations, I was devastated. Alice, the girl at the center of Junonia, is like that too. Her expectations for a grand birthday are sky high. We follow Alice through the few days that her family spends at the beach to celebrate her tenth birthday. When things don’t go as planned, Alice feels like her world is crumbling. This is a very introspective novel. VERY introspective. At times I felt like I was reading Virginia Woolf for kids. The narration takes place primarily in Alice’s head. We experience her emotional highs and lows and process her reactions to the world around her. What I most admire about this book is the incredibly accurate way in which Henkes has captured the emotional life of a nine-turning-ten-year-old girl. At that age, everything is a big deal. Hopes are high and disappointment is devastating. Every day is a roller coaster that might have some joyful laughter and some bitter tears. Alice is entirely genuine in her reactions to the changes in her world. As a reader, I felt that Alice was thoroughly developed as a character and I understood why she thought the things she did. Junonia is a terrific character study and has merit as a novel for focusing so intently and so effectively on one young person and the way she thinks. The downside of Junonia is that Alice is not terrifically likeable. She is an only child – and as a result she’s a tad spoiled. She is also very emotional and her reactions to the hiccups in her birthday plans are more extreme than they need to be. However, it’s the extremes in emotion that keeps the book interesting. Alice needs to have strong emotional responses because that is the primary action of the book. No striking events happen in these few days at the beach. It’s all about Alice’s feelings. During this stay at the shore, Alice must learn some difficult but important lessons about the emotional maturity that is expected of you as you get older. I am curious about how young readers respond to this book. I don’t think that nine-year-old me would have kept reading – I preferred stories with a lot of action or interesting hijinks. Anne Shirley’s social mishaps and the battles of Redwall were fascinating, but little Alice’s birthday musings would not have kept me reading. It’s a charming book, but it stays firmly in the realm of thought and not the world of action. This entry was posted in Middle Grade, Reviews and tagged beach, introspective novels, Kevin Henkes, Middle Grade, Virginia Woolf. Bookmark the permalink.